Next year marks the 70th anniversary of the National Health Service. Over that period medicine has been revolutionised and lives transformed. The Health Service’s founding principles – of care for all, on the basis of need not ability to pay – have stood the test of time. During one of the most vigorous debates our country has seen – over Brexit – the NHS was centre stage. The case for the NHS is straightforward. It does a good job for individual patients, offering high quality care for an ever-expanding range of conditions. It reduces insecurity for families, especially at times of economic uncertainty and dislocation, because access to care is not tied to your job or your income. And as one of the world’s most cost-effective health systems, it directly contributes to the success of the British economy. That’s because at a time when the UK is tooling-up for a new trading relationship with the rest of the world, a publicly-funded NHS means British businesses are not on the hook for an inflexible continental-style health ‘tax on jobs’. In promoting the health of our children, vulnerable populations, working age adults and retirees, the NHS also helps reduce downstream sickness and unemployment benefits costs. And as the principal domestic customer of the nation’s life sciences sector, the NHS helps fuel one of the industrial engines of our future economic growth. We’re getting healthier, but we’re using the NHS more. Life expectancy has been rising by five hours a day, but the need for modern NHS care continues to grow (1). Demand for health care is highly geared to our growing and aging population. 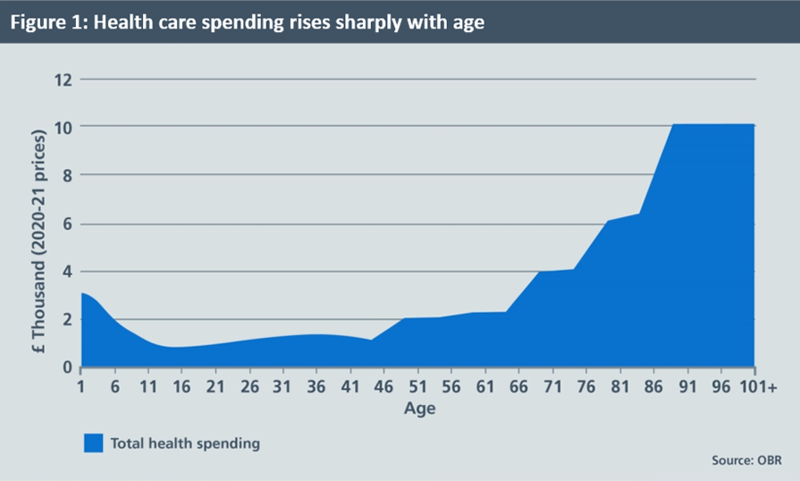 It costs three times more to look after a seventy five year old and five times more to look after an eighty year old than a thirty year old (2). Yet today, there are half a million more people aged over 75 than there were in 2010. And there will be 2 million more in ten years’ time. Demand is also heavily impacted by rising public expectations for convenient and personal care, the effectiveness of prevention and public health, and availability of social care. Even more significant is the steady expansion of new treatments and cures, of which the public are often unaware. The quality of NHS care is demonstrably improving, but we’re becoming far more transparent about care gaps and mistakes. Outcomes of care for most major conditions are dramatically better than three or five or ten years ago. Annual cancer survival rates are up (3). Heart attack and stroke deaths have tumbled (4). But greater transparency and rising expectations mean greater awareness of care gaps and variation. And although they are substantially lower than they were a decade ago, waiting times have been edging up. Staff numbers are up, but staff are under greater pressure. Over the two years from November 2014, there has been an increase of around 8000 more doctors and nurses working in the NHS (5) but there are still gaps in some professions and specialties. Frontline NHS staff say their experience at work continues to improve, with this year’s annual staff survey scores at a five year high (6). Yet only 52% of staff are satisfied with the opportunities for flexible working and 15% have experienced physical violence from patients, relatives or members of the public. The public are highly satisfied with the NHS, but concerned for its future. Perhaps surprisingly, newly published independent data spanning three decades shows that public satisfaction with the NHS is higher than in all but three of the past 30 years (7). And it reveals public satisfaction with hospital inpatients is at its highest for more than two decades. As a result The King’s Fund says that “In 2016 the NHS remained popular with the public, far more so than it was 10 or 20 years ago” (8). Looking internationally, 69% of the public in this country say they get good healthcare, compared with 57% in France and 59% in Germany, and only 47% in 22 other nations. But a higher proportion of our public are worried about the future of the NHS (9). There is now an underlying consensus about how care needs to change to ‘future proof’ the NHS, but the ability to do so risks being overtaken by what CQC has called today’s ‘burning platform’ (10). That’s why in Autumn 2014, in the wake of several years of contentious political and legislative debate, the NHS nationally came together – to chart for the first time its own direction for the years ahead. The NHS Five Year Forward View (11) crystallised a consensus about why and how the NHS should change. It described three improvement opportunities: a health gap, a quality gap, and a financial sustainability gap. It proposed a series of measures to bring about the ‘triple integration’ of primary and specialist hospital care, of physical and mental health services, and of health and social care. And it argued that while much of this lay within the power of the NHS itself to bring about, it was also dependent on well-functioning social care, extra capital investment, transformation funding to support double running costs, and activism on prevention and public health. Since publication substantial progress has been made, although this year – 2016/17 – only represents Year One of the NHS’ five year Spending Review (SR) funding settlement, and demands on the NHS are higher than envisaged when the FYFV was published. Now is therefore an appropriate moment to take stock of what has worked, and what hasn’t. And then to make any necessary course corrections accordingly. Agreed national blueprints for cancer, mental health, maternity, learning disabilities and GP services, backed by targeted initial investment. Better clinical outcomes – cancer survival at record high (12); first ever waiting times targets for mental health treatments introduced and met. Dementia diagnosis rate up from half to more than two thirds. Improving experiences of care – overall adult inpatient experience at a record high (13). First phase of fundamental care redesign under way through integrated ‘vanguard’ new care models. 20 hospitals moving out of CQC ‘special measures’, with 7 moving to a ‘good’ rating. This includes all 11 hospitals in the original 2013 cohort. Action to end inappropriate institutional learning disability services – 12% reduction in inpatients since March 2015. Patient safety continues to improve, with the proportion of patients experiencing four major causes of harm (urinary tract infections, falls, deep vein thrombosis and pressure sores) falling by around 8% over the last three years. But pressure on waiting times for A&E, routine operations, general practice and other services, with spill-over demand pressures including from preventative services and social care, which CQC warned were approaching a ‘tipping point’ (1415). SR settlement provides real terms aggregate annual NHS England revenue funding growth, but with pressure on per-person funding levels and on areas such as capital investment. Improved financial grip – trust agency/locum staffing bills down by £700 million, and CCGs on track to contribute to an £800 million managed commissioner underspend this year, on top of £600 million last year. £1.8 billion a year from the Sustainability and Transformation Fund mainly deployed to support hospital pressures. Fairest ever needs-based NHS funding allocation to different parts of the country – reducing to zero the number of CCGs more than 5% under their target, while including primary and specialised services in a comprehensive inequalities-reducing allocation formula. Some areas have not been ambitious enough in their attempts to redesign services and need to raise their game on RightCare allocative efficiency improvement. Arguably too much fragmentation in the oversight and support provided by the various national bodies. A fair conclusion from the NHS’ recent history is therefore that we have a viable and agreed strategic direction, and progress has been made. But we have a Health Service under real pressure from rising demand within a tight funding envelope (16 17). Given the importance of ending years of relative neglect of primary care and mental health, these pressures are confronting us with some difficult choices – about the relative priority of improving A&E services and cancer outcomes versus guaranteeing short waits for routine operations. But the truth is that many of the wider changes to how NHS services are organised would be needed come what may, even if money were no object. The current pressures simply underline the need to get on with them. The NHS Five Year Forward View set out why improvements were needed on our triple aim of better health, better care, and better value. This Plan concentrates on what will be achieved over the next two years, and how the Forward View’s goals will be implemented. Largely that will rely on effective local action by NHS bodies and their partners across the country. But the NHS’ national leadership bodies will also have to step up and play their part, supporting local change with national action. To that end, NHS Improvement has successfully brought coherence to the provider accountability structure that was previously split between Monitor for foundation trusts and the Trust Development Authority for NHS trusts. Similarly, NHS England’s work has evolved in three distinct phases since its creation. The first phase in the immediate aftermath of the passage of the Health and Social Care Act in 2013 and 2014 was successfully to de-risk the financial and operational transition to a new system, in which Parliament passed control of two-thirds of the NHS budget to over 200 new local groups. The second phase, mostly in 2015 and 2016, was to use NHS England’s independence and system leadership role to chart a consensus-based strategic direction for the NHS. Following the Five Year Forward View, specific national improvement blueprints were developed with key partners for urgent and emergency care, cancer, mental health, primary care, and maternity services. Real gains have since been made in each of them, as is set out in this Plan. 2017 marks the third phase of NHS England’s life where the focus shifts decisively to supporting delivery and implementation of those key priorities, as detailed in this Plan. Together with associated documentation it also formally constitutes NHS England’s 2017/18 Business Plan (18). But it also affirms the shared vision of the Five Year Forward View and approach to implementing it of the national leadership bodies of the NHS, including NHS England, NHS Improvement, the Care Quality Commission, Public Health England, Health Education England, NHS Digital and NICE, working closely with a number of patient, professional and representative bodies. The annual NHS Mandate (19) framed by the Government. Issues are also identified by Parliamentary select committees. NHS England’s direct work in multiple venues with the public, patients, staff and stakeholders (20). Healthwatch compiles an annual priorities list of the top five issues citizens want to see improved (21). For the second year running, mental health services topped the list. Convenient access to GPs, easier hospital discharge and better social care also feature prominently. These priorities are all addressed in this plan. We also recognise there are benefits from constancy of purpose, not chopping and changing. The challenges we are tackling require sustained action over several years. This Plan necessarily takes as its starting point the current legislative framework, and the funding the NHS has been allocated. Decisions on both are for government and parliament. It is not, of course, a comprehensive description of all the good things the NHS will be doing – including on maternity and children’s services, diabetes, dementia care, care for people with learning disabilities, tackling inequalities, end of life care, and improving quality in challenged providers. Nor are these all the actions we will be taking to give effect to the Government’s 2017/18 Mandate to the NHS. Improving A&E performance. This also requires upgrading the wider urgent and emergency care system so as to manage demand growth and improve patient flow in partnership with local authority social care services. (We set out the plan for Urgent and Emergency Care in Chapter Two). Strengthening access to high quality GP services and primary care, which are far and away the largest point of interaction that patients have with the NHS each year. (See Chapter Three). Improvements in cancer services (including performance against waiting times standards) and mental health – common conditions which between them will affect most people over the course of their lives. (Chapters Four and Five). Within a given funding envelope there are always limits to what can and cannot be done. While the NHS and the Government remain committed to short waits for routine operations, our new Mandate rightly recognises that there is likely to be continued pressure on waiting times for routine care and some providers’ waiting times will grow. Likewise, there is no reason in principle why extra spending on a drug treatment should automatically have a legal override so as to displace community nursing, mental health care or hip replacements – hence the new budget flexibility in the way NICE technology appraisals operate. And in times of modest funding growth, it’s right to challenge and tackle areas of waste or low value care, so as to free up investment head-room for the main priorities. (Chapter Seven sets out the details). In order to deliver these and our wider goals, in 2017/18 we will work to accelerate service redesign locally. (Chapter Six sets out next steps on integrating care locally through Sustainability and Transformation Partnerships and Accountable Care Systems). We also intend to focus on the enablers of the above, namely our workforce, safer care, technology and innovation (Chapters Eight, Nine and Ten refer). These actions comprise the rest of this plan. 7. King’s Fund (March 2017). Public satisfaction with the NHS and social care in 2016 – results from the British Social Attitudes survey. 8. King’s Fund (March 2017). Public satisfaction with the NHS and social care in 2016 – results from the British Social Attitudes survey. 9. IpsosMORI (February 2017). Global Trends Survey. and_conditions_2016-17_A.pdf. Local authority public health budgets reducing by an average of 3.9 per cent in real terms per year annum until 2020. 17. OECD (November 2016). Health at a Glance: Europe 2016. Per capita UK annual real health expenditure growth slowed from 3.3% between 2005-2009, to 0.5% between 2009 and 2015. For the period 2009-2015 the equivalent figure for France was 0.8% and for Germany 2%. 18. Prepared in accordance with Section 13T of the NHS Act 2006, as amended by the Health and Social Care Act 2012. Further material is at www.england.nhs.uk. NHS England operates under a democratic mandate from the Government. This mandate also formally endorses the plan which the NHS set for itself in the Five Year Forward View. ‘Next Steps on the NHS Five Year Forward View’ reflects how NHS England intends to meet the seven overarching objectives in the mandate.